This application demonstrates how to track moving vehicles on roads. 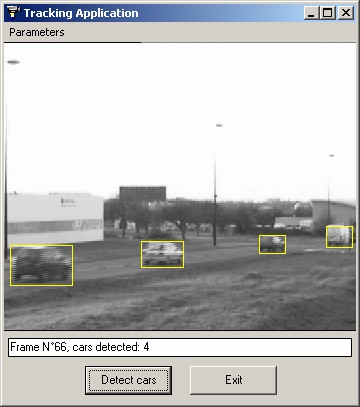 Due to high traffic of cars and trucks in industrialized countries, there are more and more requests to track moving vehicles using automatic systems based on Computer Vision. Using the Aphelion™ ActiveX components, ADCIS has developed a turn-key application which is able to track cars and other moving objects in standard situations like cities, highways, etc. The application takes benefit of the MMX architecture to process multiple images in less than a second. The algorithm involves image difference to detect the moving objects between two frames, and morphological operators to analyze the shape of the objects.